How to Send Large Files as Email Attachments in Salesforce? Salesforce is an excellent collaborative tool, but there can be some challenges when doing something unexpected such as sending large files as email attachments. If you can’t use cloud storage online or an internal file storage system, you may need to share content through email. But in order to do this, you may need to pay for extra storage space in your Salesforce storage installation, or look up Salesforce storage pricing. There is an alternative solution: MassMailer DOCS. 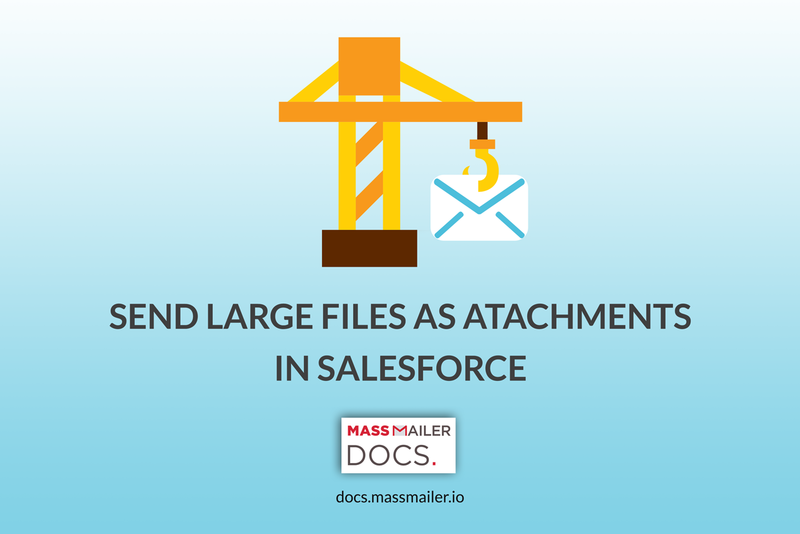 MassMailer DOCS makes it easier to store and mass email large file attachments through Salesforce. If you’re sending large email attachments, you may get Salesforce attachment errors or get a message that your storage limit exceeded allowed amounts. Salesforce limits the size of email attachments, though this limitation has gone up with time. The general limit for a Salesforce message is a 25 MB attachment, which means that emails cannot be sent with attachments that exceed around 24 MB. This is because the full limitation is 25 MB, including the message itself, headers, and any other information. In order to send large email attachments through Salesforce, it may be required to split the email attachment into separate parts. This can be done with an archive solution, which can separate a single file into multiple archive files, often .ZIP or .RAR. If the email attachment is already an archive (a .ZIP or .RAR file), it can be unpacked and its components can be sent individually as additional attachments. An easier solution is to use MassMailer DOCS. MassMailer DOCS integrates directly into Salesforce, storing Salesforce files and mass emailing them directly as file attachments. Online storage systems or a file share solution can give you more storage space, if you’ve found that you’re exceeding your Salesforce storage or if you don’t want additional Salesforce storage costs. By default, Salesforce file storage limits are applied to everything from emails to saved documents, and the Salesforce document management system as a whole has a shared storage limit. MassMailer DOCS stores your Salesforce documents for you, so they can then be mass emailed to your Salesforce contacts. MassMailer DOCS additional tracks stats such as opens, clicks, and bounces so you know whether your attachment was read and received. Rather than relying only upon Salesforce, you can send large files through a file sharing system or a secure file transfer application. Secure cloud storage apps like MassMailer DOCS makes it easier to transfer files quickly between colleagues and customers; you can store large files online and then send out links through the Salesforce app. This also allows for file revisions at the same time as file sharing, with a single consolidated version. This is often the easiest way to send large files. There’s also free storage for file sharing, systems that offer unlimited online storage, and systems that allow for storage file versioning so employees never lose their data. As Salesforce does have fairly strict limits on email size, it may become necessary to utilize a different file sharing system or simply split emails into multiple parts. Salesforce also has some other email limitations, such as the maximum amount of 5,000 emails that can be sent per day. Luckily, Salesforce can be easily integrated into any online file storage system, for easier document sharing. MassMailer DOCS can be used to send large volumes of mass emails with ease. Install MassMailer DOCS today to take it for a test drive.